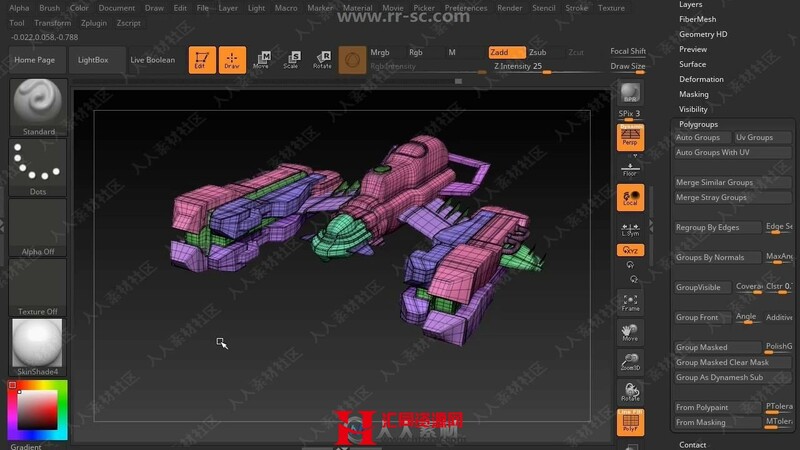 In the Scifi Ship Series, we’ll sart by creating simple shapes via edge extrusion in Maya as it’s one of the easiest methods to create viable meshes. When creating meshes in Maya, the fewer tools you use, generally, is the better your end result because you end up focusing on the best aspects of the tools to create what you need. Edgeloops for better subdivisions are paramount when working with models that are going to be more than just ‘game ready’ (low poly) and will help create cleaner bevelling when the mesh smoothes as opposed to subdividing without edgeloops. Once the mesh has been imported into Zbrush, proper usage of polygroups will assist in mirrored details and overall cleanliness. IMM (InsertMultiMesh) Brushes are vital to helping to add the ‘greebles’ and accessories to hard surfaces to add interest. LiveBoolean is a new tool that’s paramount in creating inset cuts and booleaned shapes within the Zbrush subtools to add more futuristic details to parts of the sci-fi spaceship. When combining tools in Zbrush, like IMM brushes with LiveBooleans, the speed at which the model is populated with details is greatly decreased, which helps with tight deadlines in production. Add in using SliceCurves to add polygroups to a mesh with Curve Functions to create frame meshes that follow the seam of the polygroups precisely, and the end results are a model that looks thoroughly populated yet futuristically refined. This course will consist of 5 volumes and we will be releasing a volume every week. The downloadable version will be available at the end of the series release.